What is the Cytokine Storm? People often think of external microbes as their worst enemy during an outbreak of influenza or bronchitis, but the body’s own immune system is potentially more lethal. When the body detects foreign microorganisms indicating an infection, it might respond by over-protecting the site of infection. It may race so many antibodies to the infection site that they collect in a cytokine storm. When the infection is in the lungs, for example, this response can potentially block airways and result in suffocation. Medical researchers have identified the causes and stages of the reaction and are working on treatments to weaken an overactive immune response. At all times, white blood cells circulate in the bloodstream and are the first to sense if a virus or bacteria has infiltrated the body. Immediately, other immune cells, including T-cells and macrophages, are sent to attack the infection. During this stage, a person’s immunity functions properly, and immune cells attack the microbes so they do not get too strong a foothold. For reasons that are not completely understood, too many immune cells can be sent to the infection site. This happens when a particular type of molecule in the body, known as cytokines, activate the immune cells at the infection site and cause more immune cells to flood the site of infection. This propagates what is referred to as a cytokine storm, where far too many immune cells are caught in an endless loop of calling more and more immune cells to fight the infection. The reaction ends up inflaming the tissue surrounding the infection. When the infection is in the lungs, this severe inflammation can cause permanent damage. A prolonged cytokine storm will eventually shut down breathing completely. The airways get clogged, and cells no longer properly absorb oxygen. This is what makes the reaction so deadly in certain epidemic strains, such as bird flu. 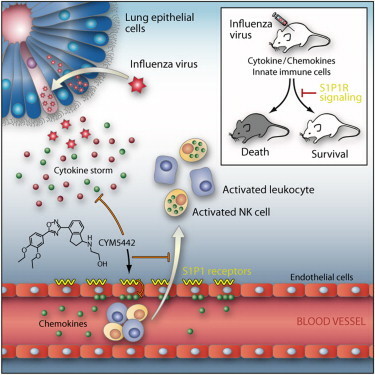 Even bronchitis, other varieties of influenza, pneumonia, sepsis, and possibly rheumatoid arthritis are susceptible to triggering a cytokine storm. Of course, flu vaccines are usually effective at preventing the flu during its peak season, but they are no guarantee, especially when flu strains mutate after the vaccine has been manufactured. Therefore, researchers are pursuing other methods of preventing this extreme immune response by bioengineering a drug that could slow the snowball effect of antibodies. They hope to force the cytokines to recirculate in the bloodstream, rather than pool in the area of the infection. Experts predict that a major influenza pandemic could kill millions of people worldwide, as it has done in centuries past.